I guess I am going through perimenopause. The reasoning behind this is because my hair has been falling out in bunches. Handfuls of it. Daily. I didn't know what to do so I thought I would talk to the people of Neocell and see if they could help me. They came through. With Keratin Hair Volumizer. Hair is made from keratin. As the actual hair is formed and it exits our body in the hair follicle, it dies and our hair is created. This is why no matter what kind of conditioning treatments you do to your hair, they are only a temporary fix. Hair can be physically changed by coloring and by using permanents to alter its texture to form curls or relaxing agents to make it straight. Adding keratin to the hair allows you to actually fix some of the damage that is done to the hair, Or, you can add more volume to it to the hair with by taking the keratin. A couple of years ago I did a review of the Neocell Biotin Bursts (http://bit.ly/1wIocKN), which I went crazy for. Biotin actually decreases the time that it takes for hair to grow. Hair and nails grow faster and skin just glows. I love Biotin. It is one of those wonder nutrients that I take everyday to help keep me looking younger and to keep my hair and nails in tip top shape. So, I was also sent the Neocell Keratin Hair Volumizer to try out. I was very excited about this because I wanted to see if it would help my hair be more thick and lustrous. I also wanted to see if it would help my nails. My nails are brittle and dry. Nails are formed from keratin and the biotin does not actually help make them stronger, it only helps to make them grow faster. 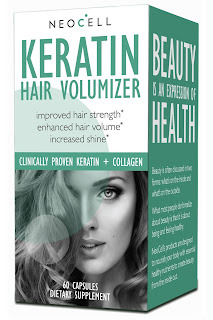 The Neocell Keratin Hair Volumizer is an all natural solution for strong, lustrous, thick healthy hair. If your hair is dry, brittle and thinning then this is for you. Hair that is dry, brittle and thinning is often associated with a lack of nutrients that are essential to strong and resilient hair. This product contains ingredients that have been clinically proven to enhance hair strength and reduce hair loss. Its key ingredients are Cynatine HNS Solubilized Keratin, Hydrolyzed Super Collagen, Amla Extract and Vitamin C.
The Cynatine HNS Solubilized Keratin has the ability to convert natural keratin into a functional form that is bio-available to the body. It is solubilized to be both bioactive and bioavailable (the ability to be used by the body) in the body, which allows it to bind with hair. It reduces hair loss from washing, it improves hair strength and it improves the brightness and luster of hair. Hydrolyzed Super Collagen is a structural component of hair, skin and nail health. It is a rich source of glycine, proline, alanine and hydroxyproline, which are the main components of collagen in the hair. This pharmaceutical grade collagen is enzymatically hydrolyzed so that it has an amino acid ration with a low molecular weight for maximum bioavailability. Amla Extract (Indian Gooseberry) has been used for centuries in Ayurvedic medicine for its anti-aging properties. It provides high concentrations of Vitamin C and is a powerful anti-oxidant. Vitamin C is an anti-oxidant that is a very important part of optimal collagen formation. So, does Neocell Keratin Hair Volumizer work? Yes, it does. My hair had been losing some of its luster and I had been losing a lot more than usual. After using this product for a month I definitely was not losing as much hair as usual and my hair looked more voluminous and felt better. I mean I had been losing handfuls of hair in my brush when I brushed my hair. I was worried I was losing my hair. After two months of this product my hair looks fuller and thicker than it did and I am not losing as much hair anymore. My hair is getting back to normal and it feels more like itself.I did notice that my hair had more bounce that usual. Here is a photo of my hair now, even though I have it put back, and off to the side, you can see it is fuller and there is less thinning now. My hair is fuller than ever and has stopped falling out all over my brush. It does take a while to work, so give it at least a month and a half to really make a difference. I also wanted this product for was my nails. I have dry, brittle nails that break and bend like crazy. These capsules did help to give my nails more strength. Now granted, they were not perfect, but I love how they were definitely better. Stronger and did not break as much. For me this is worth it. My nails are just awful. I cannot grow them out at all. They are definitely stronger to the point that they do not bend as much and I can grow them out some more. These capsules were voted a Vanity Fair top Beauty Blog choice! Neocell Keratin Hair Volumizer retails for around $18.49 for 60 capsules. They can be purchased at VitaminShoppe, and more: http://www.neocell.com/buy.php. Like Neocell on Facebook:https://www.facebook.com/NeoCellCollagen; Follow Neocell on Twitter: @NeoCellHealth; Follow Neocell on Instagram: http://instagram.com/neocell/; Subscribe to Neocell on YouTube:https://www.youtube.com/user/neocellcorp?feature=CAQQwRs%3D and Follow Neocell on Pinterest:http://www.pinterest.com/neocell/.